Chances are that around the corner from the analytics project you’re working on that’s using SaaS data piped-into your data warehouse using a service from Stitch or FIvetran, there’s a marketing analyst using Google Sheets and an add-in from Supermetrics to analyze their channel advertising spend. Supermetrics are the biggest analytics tool vendor company you’ve never heard, and that’s because their products are aimed squarely at marketers, not data engineers or data analysts, and within that particular market they’re massive; what they sell is easy-to-setup connectivity to all the major advertising and social networks directly from within Google Sheets in the form of the Supermetrics Google Sheets Add-In, a product we’ve used in the past when looking to to understand how well we place in Google search results for keywords relevant to our business. Supermetrics do two things well; they provide connectivity to all the major ad networks that marketers’ use (and there’s lots of them beyond the basic Adwords, Facebook Ads and Snapchat Ads that we’re most familiar with), and they focus exclusively on the non-technical, marketing user rather than data engineers and data analysts, providing in-addition to their Google Sheets add-in a connector for Google Data Studio, for example. But although you can use Google Sheets as federated sources for Google BigQuery tables and theoretically you could then use the scheduled data refresh feature in Supermetrics’ add-in to regularly download new data and thereby create a sort-of data pipeline into your warehouse, in-practice this probably requires a bit more knowledge of how BigQuery works than the average marketer is likely to have. 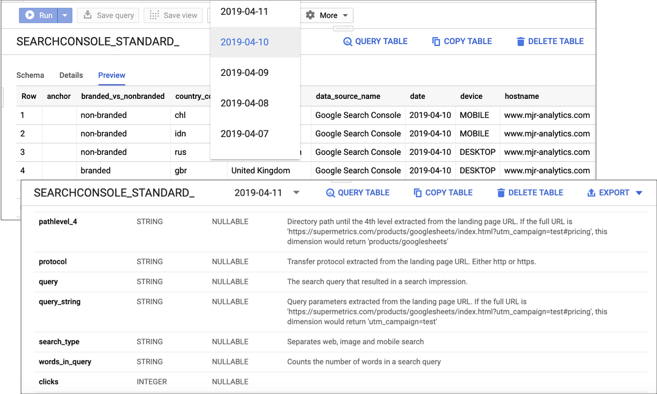 So I was particularly interested to see that one of the new BigQuery features announced at Google Cloud Next’19 last week was a number of Supermetrics-provided data connectors for BigQuery in the Google Cloud Marketplace, providing data pipeline-as-a-service connectivity from ad network sources such as Bing Ads, LinkedIn ads, AdRoll and others and with data being fed directly into Google BigQuery using their Data Transfer service. Its when you look at how Supermetrics land data into BigQuery though that you see their difference in approach; instead of presenting you with several tables of data mapped to the structure of the API calls for each service, the Supermetrics BigQuery tables are typically denormalized (flattened into one big table of data) and come with extensive and verbose column descriptions and metadata, making it much easier for marketers to know what each column is used for and the precise definition of all the metrics and dimension attributes. Pricing is per data source with a 14-day free trial at the start, to me it looks like Supermetrics are looking to position their pipeline-as-a-service in-between Stitch and Fivetran’s in-terms of pricing but with the service aimed at marketers, not data engineers. Details of pricing and pricing metrics are on the Supermetrics support page and full details of the service are on the Supermetrics for BigQuery product homepage. Today I’m excited to be launching MJR Analytics, a new consulting company focusing on modern, cloud analytics projects using technology from Looker, Qubit, Fivetran, Oracle and Snowflake and development techniques learnt from my time working as an analytics product manager at a startup in London. So what have I been up to in the two years since I left my old consulting company, and how has that experience and the way I’ve been working with analytics technologies over that time inspired me to start another one? Two years ago I announced on Twitter that I’d left the company I’d co-founded back in 2007 and intended to now take on a new challenge, and then spent the rest of the week at Oracle Open World cycling over the Golden Gate Bridge and coming back on the ferry and trying to decide what that challenge might actually be. For most of my time in the IT industry I’d been working on projects implementing products from vendors such as Oracle and I’d always been interested in how these products came to market, how software vendors came up with a strategy and roadmap for those products how the team behind those products worked with the engineers who built them. I’d also become increasingly interested in the startup world and towards the end of time time at Rittman Mead had taken-on an informal role advising Gluent, Tanel Poder and Paul Bridger’s product startup who were building software that enabled big enterprise customers to offload their data warehousing workloads from expensive proprietary databases onto to cheap, flexible storage and processing running on Hadoop clusters. What appealed to me about working more formally with Gluent was the opportunity it gave me to work with two smart founders and an even smarter development team developing a product built entirely on big data technology I’d until then only scratched the surface with on consulting gigs. The product marketing role I took on was all about establishing what market that product was primarily intended for, how we went about positioning the product to appeal to that market and how we then brought that product to market. otherwise you’ll spend your time building a solution to a problem that nobody actually has, and that’s the reason the majority of tech startups end-up failing. Solving a problem for a market that’s willing to pay you money to solve is called “product/market fit” and if your product has it, and you’ve built your business such that it scales linearly as more customers discover your product, then you’re going to make a lot more money than a consultancy constrained by how many hours in the week your consultants can work and the upper limit on how much you can charge for a single person’s time. in the end it I realised that it was product management that interested me the most and, after a couple of meetings with an old friend who used to run product management at Oracle for their business analytics product line and who had recently moved to London and now lead the product team team at Qubit, a technology startup created by four ex-Googlers building marketing technology products based-around Google’s big data and cloud technology, I joined their team later in 2016 as product manager responsible for the analytics features on their platform. I spoke about the Qubit and the partnership we established with Looker back in May last year at a presentation at Looker’s JOIN 2017 conference in San Francisco and the slide deck below from that event goes into the background to the product and the problem it solves, helping customers using Qubit’s personalization platform make more effective use of the data we collected for them. The multi-tenant data warehouse and hosted Looker instance we then put together to enable customers without their own Looker instance to make use of their data in Google BigQuery, doing so in a way that supported per-tenant extensions and customizations by the customer or their implementation partner. What I’ll take-away from my time at Qubit though was the incredible amount that I learnt about product management, product engineering, how to build and run a successful startup and team who are still highly-motivated seven years in and the introduction it gave me to the analytics and data-led world of digital marketing, eCommerce and modern data analytics platforms. I learnt so much from my colleagues at Qubit about products, engineering and building a successful and motivated team that put up with my jokes and built the most technologically-advanced marketing personalization platform on the market. Which is why after two years away from the consulting business and two enjoyable, rewarding and enlightening years working on the other side of the data and analytics industry I’m now launching my new consulting company, MJR Analytics; and I hope to be working with many of you as clients or members of our team over the coming months and years.